Contractors and Architects - Penn Big Bed Slate Co. 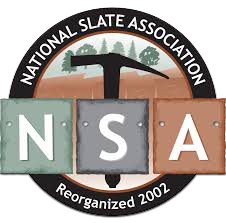 This section is for professionals- contractors, installers and architects needing information and specifications for application of slate products. 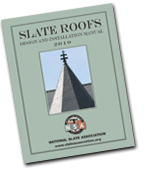 Extensive and definitive information about slate roofs is available in the manual called ‘Slate Roofs – Design and Installation Manual‘, distributed by the National Slate Association. A copy can be purchased here. Click here for a PDF on Physical Properties of Slate. Click here for an article on Knots and Knurls written by Peter Papay. DISCLAIMER: Penn Big Bed Slate Company, Inc. assumes no responsibility whatsoever for the application, or misapplication, modification, or adaptation of the information contained on this page and website for the design, specification, or construction of any specific slate installation or portion thereof, or for any other purpose, by a user, reader, or any other party. Penn Big Bed Slate Company, Inc. expressly disclaims all liability for damages of any sort, whether direct, indirect or consequential, arising out of the use, reference to, or reliance on the information given on this page and website.